Martins Beach, like all California beaches, belongs to the public. But billionaire Vinod Khosla closed the accessway to the ocean, preventing the public from visiting what is rightfully theirs. The Surfrider Foundation filed a successful lawsuit in 2013 to address the property owner’s development that blocked public access, and to ensure the California Coastal Act was enforced. We now await a decision as to whether the U.S. Supreme Court will consider Mr. Khosla’s appeal of our legal victories. Surfrider has prevailed at every stage in court so far and will continue to work to protect the beach for all people for this and future generations. For more than 100 years, generations of families, friends, kids and loved ones have spent time at Martins Beach, a sandy stretch of coast near Half Moon Bay in Central California. Hundreds of people have publicly shared their stories about multiple generations that enjoyed annual traditions, special celebrations, the ocean and waves, and family gatherings at their public beach. However, this history of use by local communities and the public was disrupted when the gate leading to Martins Beach Road was closed and locked so that the public could no longer access the beach. Billionaire Vinod Khosla purchased the entire property bordering the coast in 2008 - after Khosla’s property manager was informed that public access previously existed and would need to continue to be preserved, by the San Mateo County Planning and Building Department. Khosla then illegally closed the only accessway to the beach in 2010. He hired a security guard to keep people from accessing the publicly-owned beach, posted ‘no trespassing’ signs and painted over the billboard which advertised the presence of the single accessway that led to the natural coastline. Beaches in California are public trust resources. By law, the public has the right to beach access in the state of California from the mean high tide down. This right to public access is guaranteed by the state’s constitution and mandated within the California Coastal Act, which makes closing the beach to the public illegal. 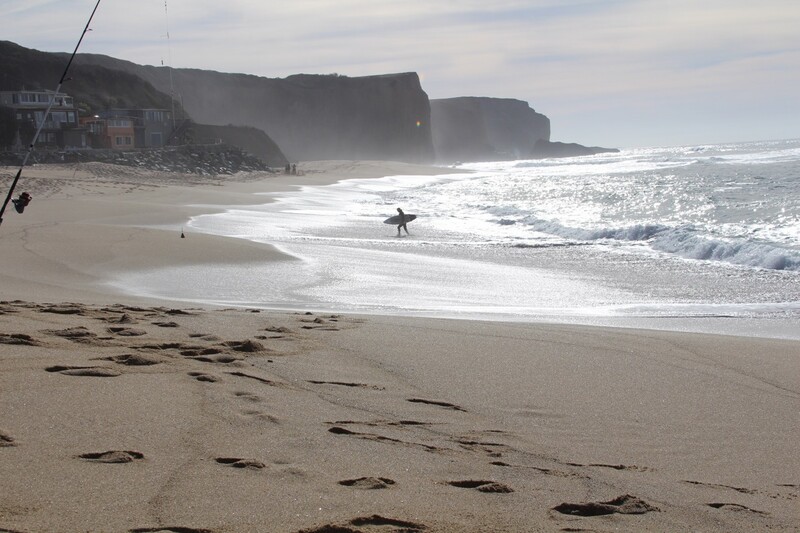 In order to restore the beach access that was taken away at Martins Beach, the Surfrider Foundation San Mateo County Chapter started a campaign in 2011, which began by reaching out to Mr. Khosla to seek his assistance in restoring public access to the beach. Upon receiving a response from an attorney representing Khosla, which stated Khosla’s preference to litigate the matter, Surfrider’s campaign scope expanded to include advocacy to relevant city officials and state agencies, as well as public education on the issue. In 2012, the Surfrider Foundation worked to secure a successful defense in court for the ‘Martin’s 5,’ five surfers who were ticketed for trespassing when they walked down the only pathway to the beach. The judge dismissed the charges of trespass, citing “insufficient evidence,” and the District Attorney represented to the public that any charges of trespass would not be prosecuted while litigation pertaining to Martins Beach was pending. When all of these efforts still did not result in the restoration of public beach access, the Surfrider Foundation filed litigation in 2013. During the past five years, the Surfrider Foundation has been successful in this litigation at three different levels of California courts. Now, Khosla has petitioned the U.S. Supreme Court to hear the case. The Surfrider Foundation has submitted a Brief in Opposition to this petition and stands committed to defending our strong California court decisions. Ultimately, this is about one person believing that his private property rights grant him the authority to trample on laws that protect and promote public access to California beaches, ignore long-standing history and tradition of public use of this accessway to the coast, and preclude local community members, families, citizens and multiple generations that have enjoyed the public beach for more than 100 years from exercising their rights to visit and enjoy the beach. The beach belongs to everyone and the Surfrider Foundation will continue to stand up to fight for the rights of all people, regardless of background, class, location or demographics, for this and future generations. For additional background, visit Surfrider’s timeline of our work to protect public beach access for all people at Martins Beach.